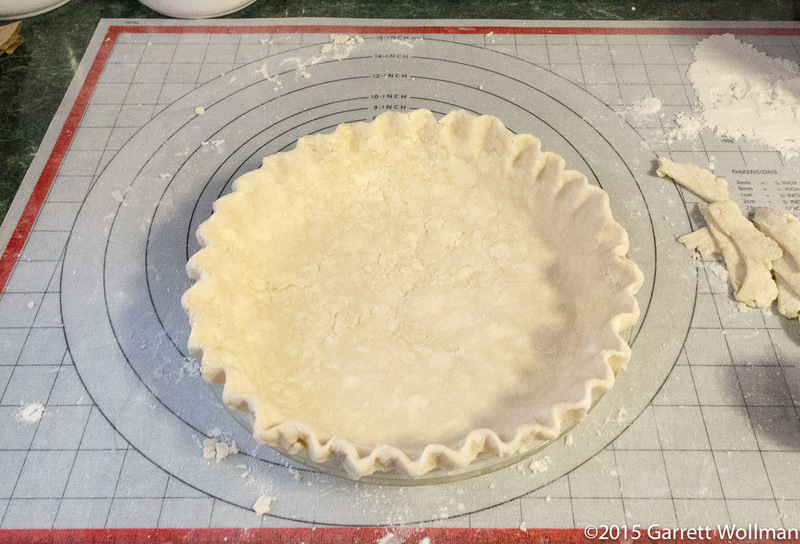 Previously, I gave step-by-step instructions for making Joanne Chang’s pâte brisée, an all-butter pie crust. At that time, I noted that her technique was a little bit unusual (using a stand mixer), and her particular formula is a bit richer (due to added egg and dairy) than a traditional pie dough. 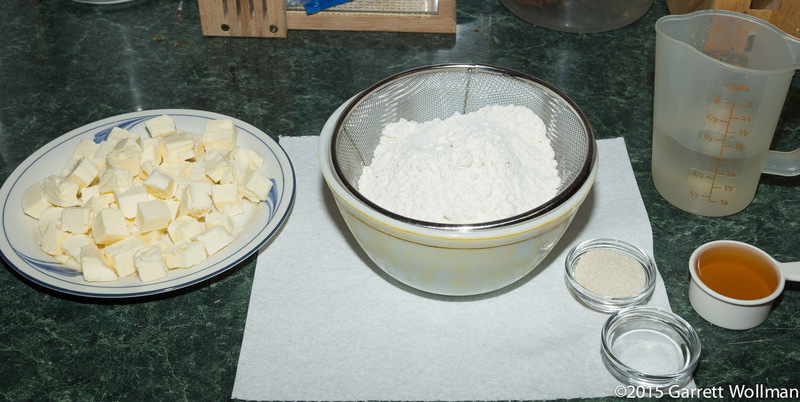 So here is the promised tutorial on making a more standard butter-flour-water pastry (still technically a pâte brisée), based on the “All-Butter Crust” recipe from The Four & Twenty Blackbirds Pie Book by Emily and Melissa Elsen. You should totally buy this book if you are at all into baking: not only are there a whole bunch of great pie recipes, but the recipes are ideally structured to separate the crust preparation from the filling, which makes them more general, and there are lots of photos and a good introductory section that clearly describes all of the steps I’m about to demonstrate, with variations. This is the book that convinced me baking pie was easy and fun. Note that their procedure is entirely manual, using a pastry blender — a process that I find irritating beyond all reason — so I will describe how to make it using a standard-size food processor. As presented here, this recipe makes about 750 g of pastry, enough for two nine- or ten-inch pies or tarts, or one double-crust pie; this is the most my food processor can handle, or else I would do an even bigger batch, because this pastry keeps very well in the freezer. 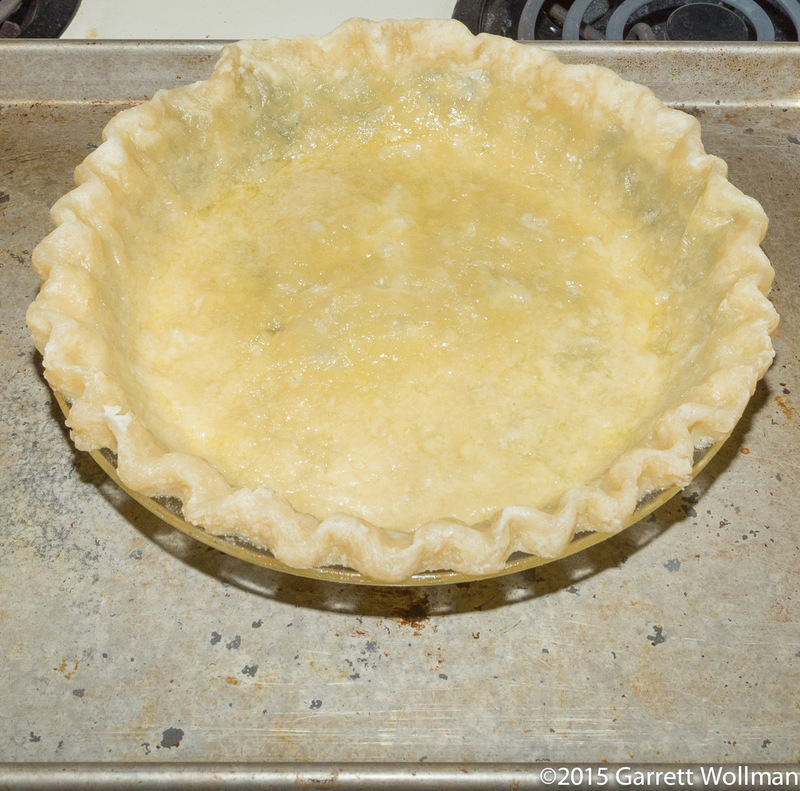 In this particular case, I was making a single-crust custard pie (post forthcoming), and in this tutorial I’ll also show the process of partially blind baking the crust as called for in that recipe. Total time required is about 15 minutes to prepare the dough, several hours of resting, another 15 minutes forming the pie shell, and 25 minutes of baking. We start, as always, with the mise en place. 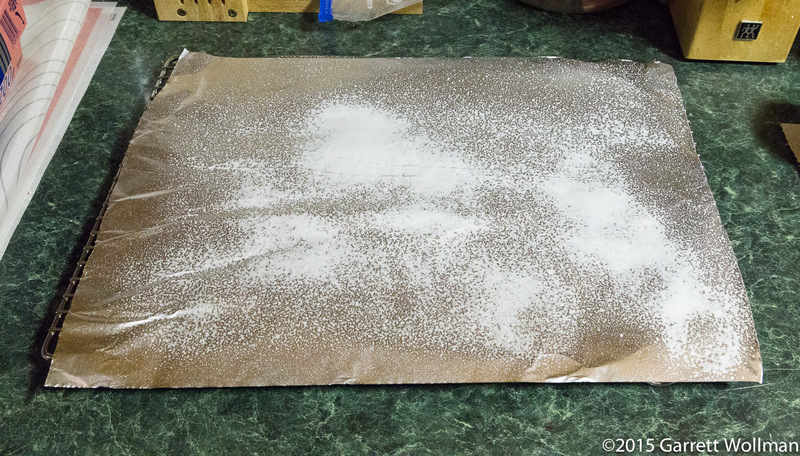 On the paper towel, I’ve placed the usual dry ingredients: 12½ oz (350 g) of flour, 1 tsp of kosher salt, and 1 tbl of granulated sugar. For the flour, in this particular case (although it’s not what the Elsens recommend), I used a 50-50 mixture of King Arthur pastry flour and all-purpose flour. For the fat, this recipe calls for two sticks (225 g) of chilled unsalted butter, cut into ½” (10–15 mm) cubes — I prefer to freeze the butter after dicing it. The liquid ingredients are represented by 1 cup (240 ml) water and ¼ cup (60 ml) cider vinegar; the water will be iced later, when I’m ready for it. It’s always a good idea to put the dry ingredients into the food processor first and give them a whir, to ensure they are fully combined, before adding the butter. 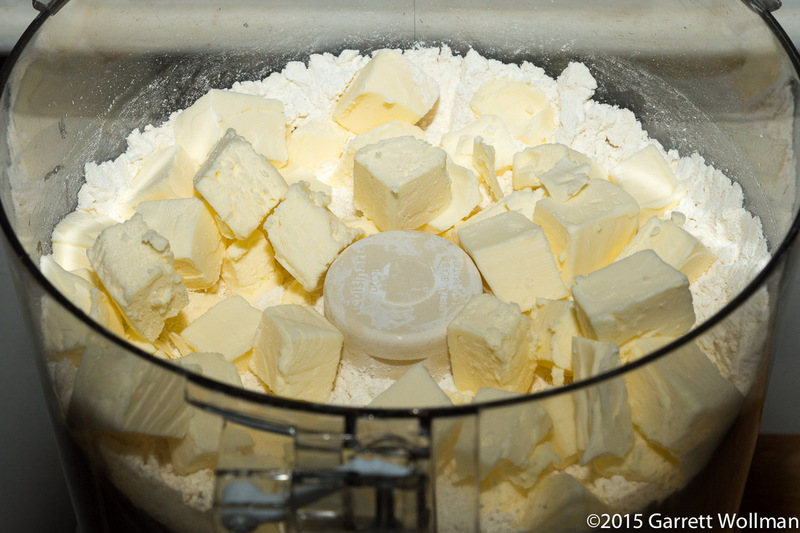 Just scatter the butter on top of the flour and give it about ten one-second pulses. Check the texture after eight pulses, and again after every couple of pulses. 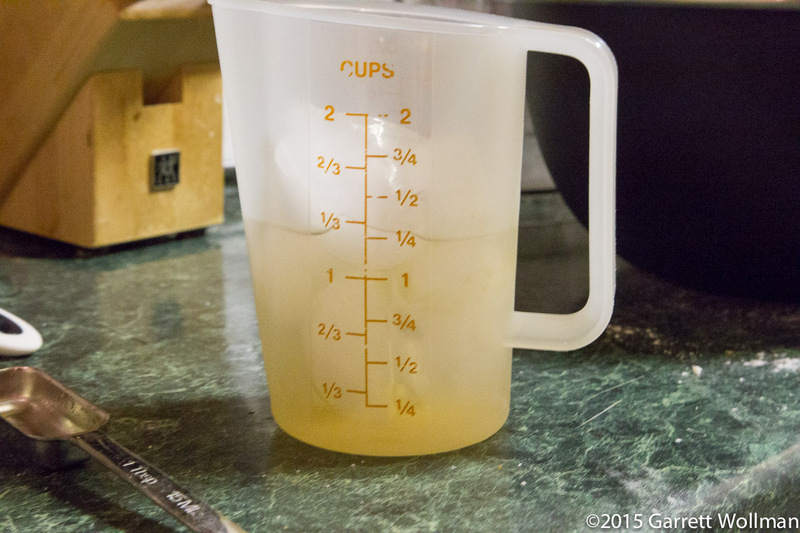 At this point, add an equal volume of ice to the cup of water, and then mix in the cider vinegar. The vinegar serves two purposes: it adds a small amount of flavor, but more importantly, it serves as an insurance policy against excessive gluten formation in the pastry, which allows more and easier handling of the dough before it becomes tough. For some applications, this may be replaced by lemon juice or a different kind of vinegar; sometimes, if a stronger citrus flavor is desired, all of the water may be replaced by fruit juice. If you have a food-grade spray bottle that can hold the ice water (mine is too small), put the mixture in there; otherwise, use a measuring spoon to dispense the liquid. If using a spray bottle, spray liquid onto the flour-butter mixture until the top is moistened; otherwise, sprinkle about two tablespoons of liquid onto the surface as evenly as you can. Using a rubber spatula, gently fold the flour-butter mixture to distribute the liquid evenly. 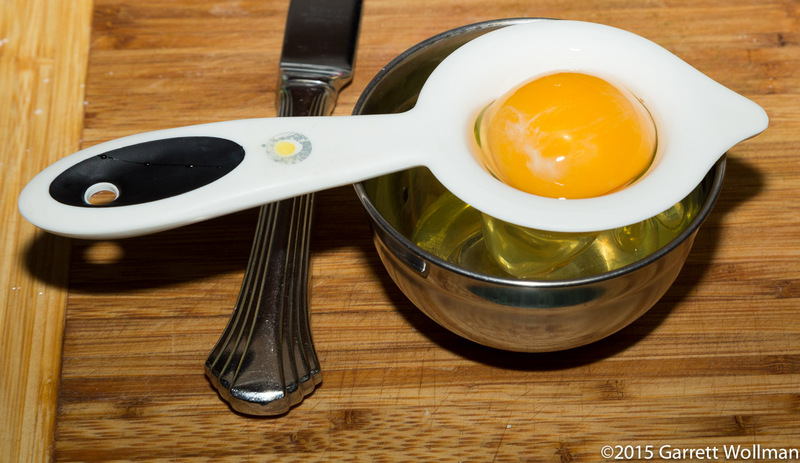 Continue adding the liquid, a tablespoon or two at a time, and folding, until there are no completely dry bits left. Do not be alarmed if you do not use all of the liquid. When sufficient water has been added, you should be able to form a clump in your hand that holds together like this. 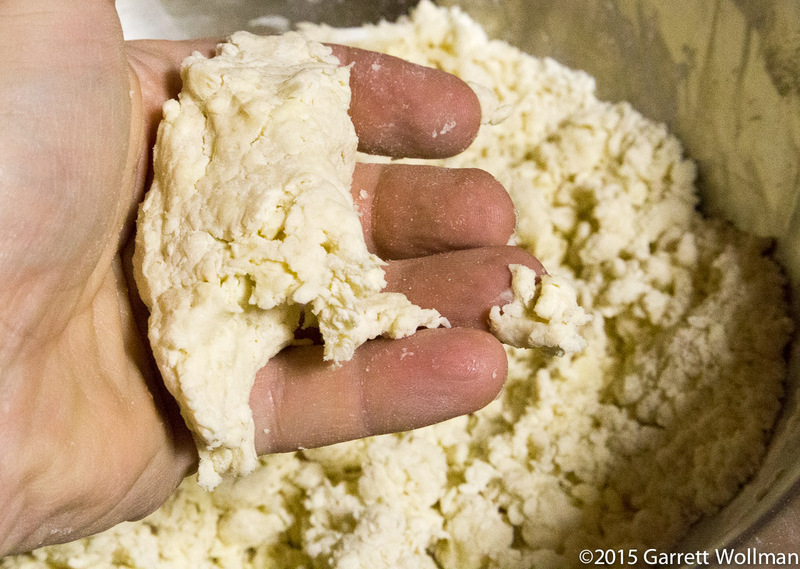 The dough will still look rather shaggy at this point. In this case, I only used half of the liquid. This recipe makes about 750 g of dough — obviously this will depend on how much water you end up adding — and should make two crusts, so I divided it up into two 375-g portions. Each portion should be formed into a flat disk and wrapped tightly in plastic wrap, then refrigerated for at least an hour, preferably overnight. 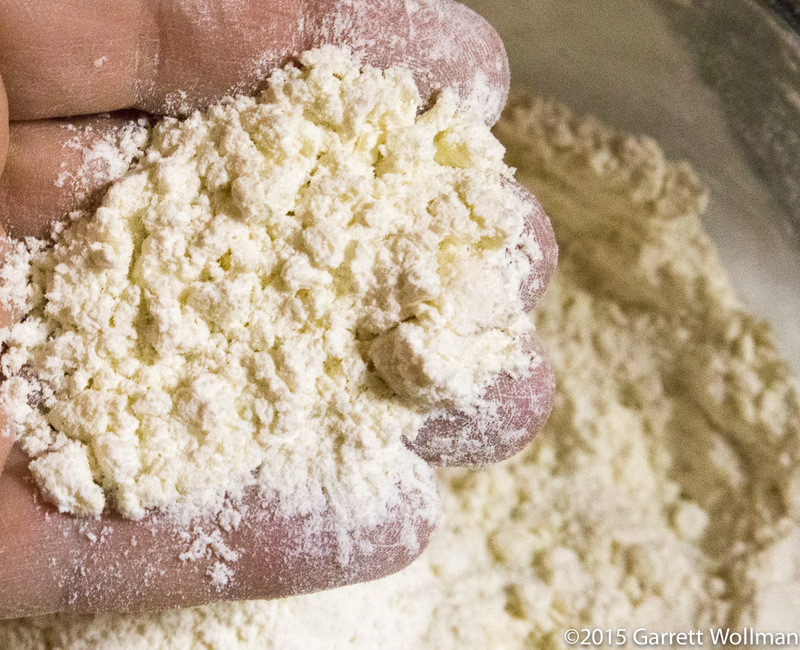 This “relaxation” period is essential to allow the flour granules to become evenly hydrated. Do not put the dough directly into the freezer; wait until it has rested. I took both disks of pastry out of the refrigerator. Because the pie I’m making today is a single-crust pie, one of them went into a zip-top bag that I tossed in the freezer for future use. (The frozen dough can be resuscitated by letting it sit in the refrigerator for about 24 hours; it will keep in the freezer for about a month. Unfrozen dough will keep in the fridge for a few days, a week at the very best.) 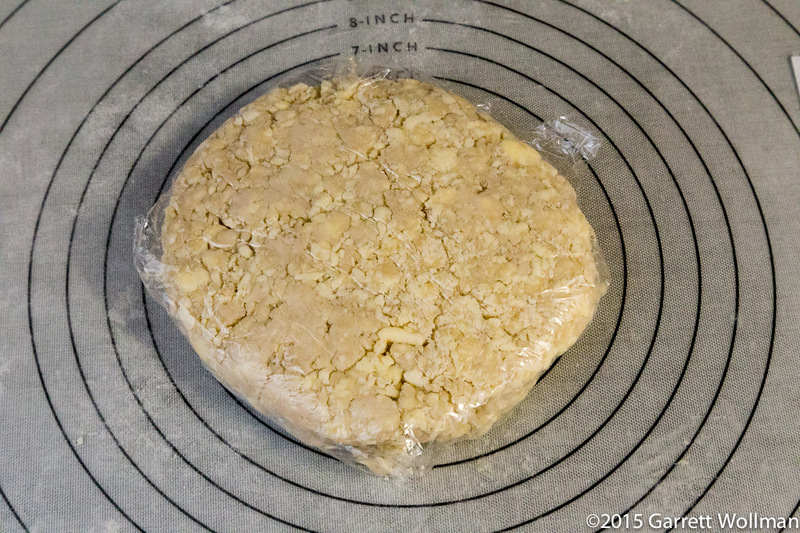 The other dough disk sat here on my pastry mat for about half an hour, still in its plastic wrap, until the butter just started to soften. 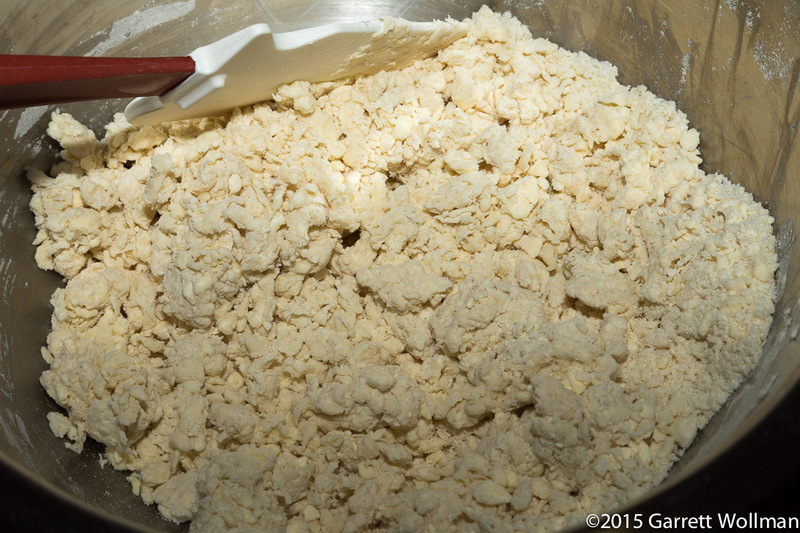 Note how the dough still looks a little shaggy, even after the long rest, and there are chunks of butter visible; as the dough is rolled and worked, it will start to look smoother and come together completely. 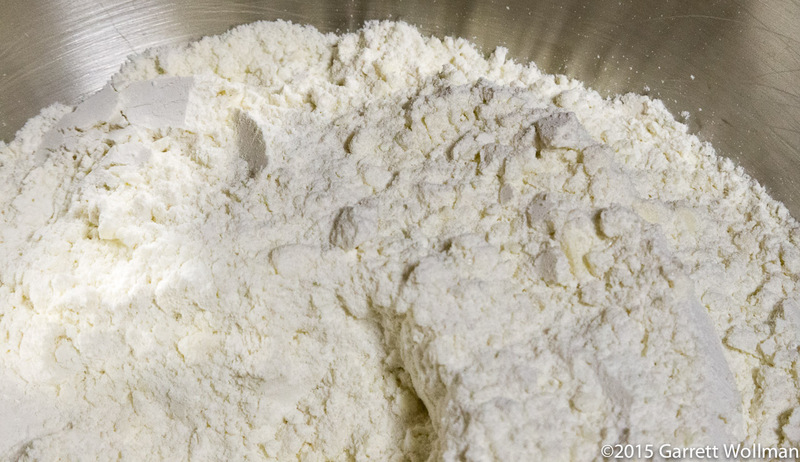 As in the previous tutorial, the rolling surface, dough disk, and rolling pin should all be lightly floured before starting the rolling process. Roll out the dough by placing the rolling pin about ¼ the way up from the bottom and rolling away from you, applying as even a pressure as you can. I am once again using spacer bands on my rolling pin to keep the dough thickness even, although I don’t usually with this recipe. 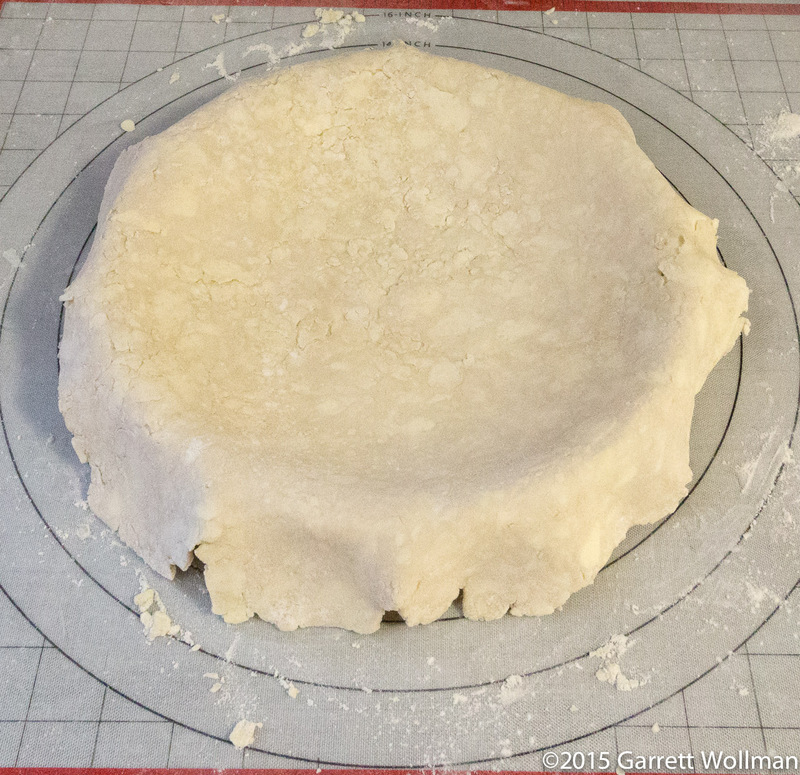 Between every roll, rotate the dough an eighth of a turn, which will ensure that it stays roughly circular. As you roll, every so often flip the growing dough disk over and apply a little more flour; this will ensure that the surface is smooth and also help keep the dough from sticking to the surface or to your rolling pin. You can see that the dough looks much smoother than it did before, although there are still obvious large flakes of butter visible on the surface. A few more rolls, with the help of the spacer bands, and it’s done. (For a nine-inch pie, the dough should be about an eighth of an inch (3 mm) thick, and about 12 inches (30 cm) around.) Don’t worry if the edges are a bit craggy and uneven: they will be trimmed off shortly. To pick the dough disk up. 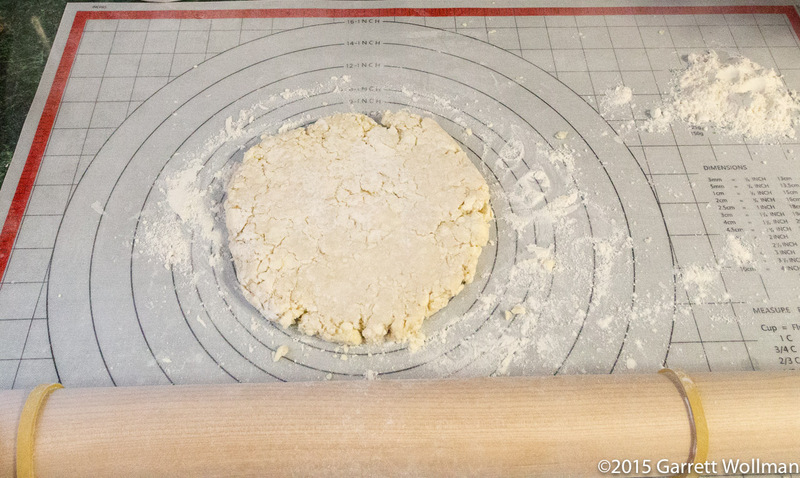 place your rolling pin just below the center of the disk, then lift up the far edge and fold it over the pin as shown. 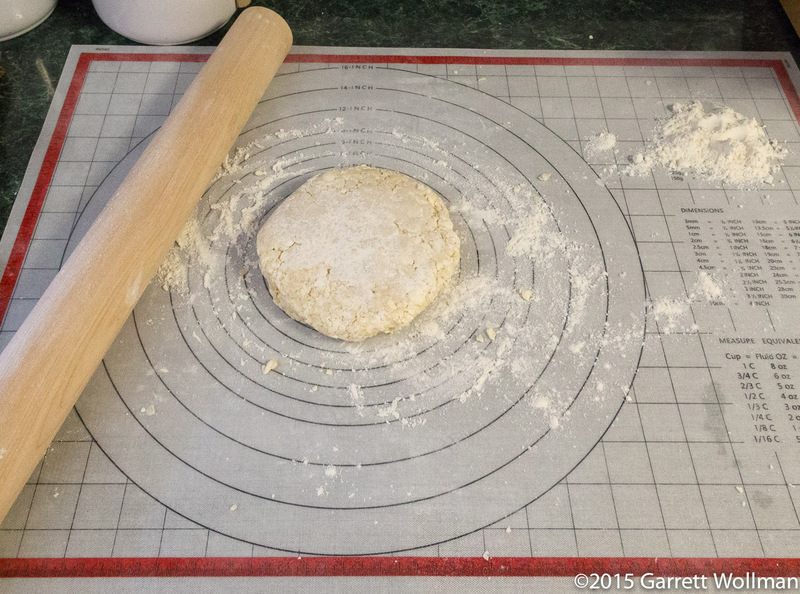 Then lift up the rolling pin and use it to carry the dough to the prepared pie plate. 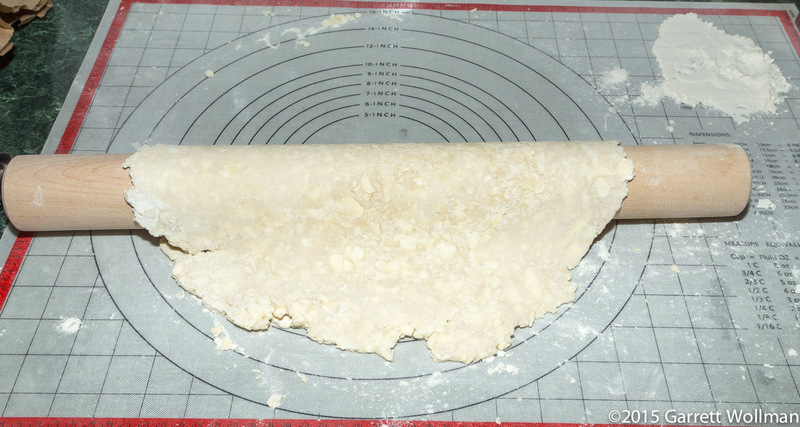 Visually align the dough with the far edge of the pie plate, and carefully roll the rolling pin to deposit the dough round on top of the plate, making sure not to stretch or tear the dough. 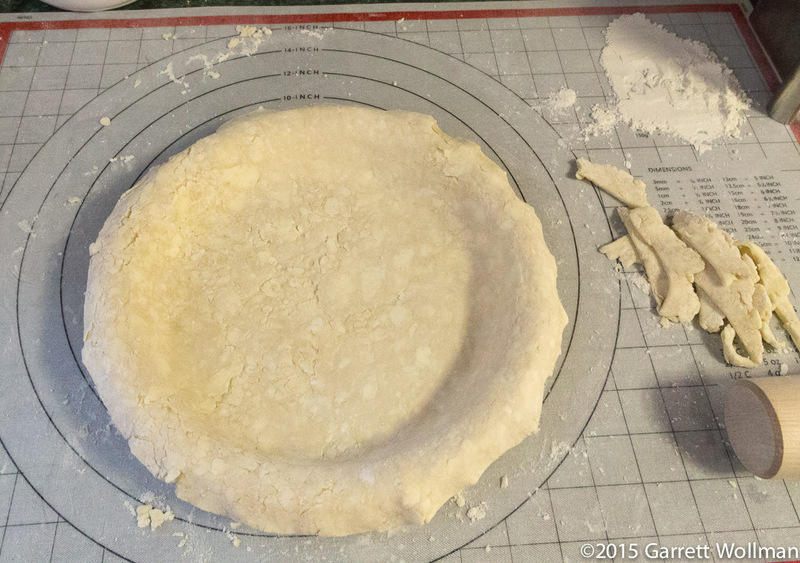 Once the dough is approximately centered on the pie plate, carefully lift around the edges and press the dough completely into the plate, without stretching, being sure to work out any air bubbles underneath the pastry. 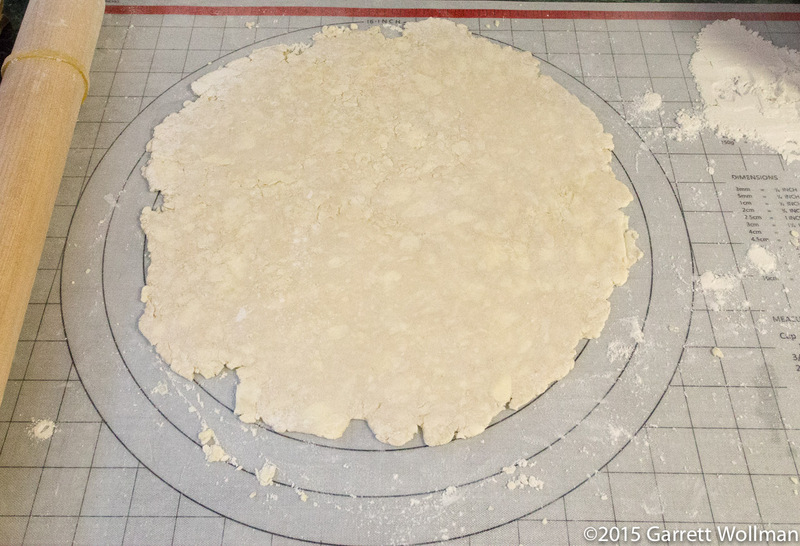 Using kitchen shears, trim away the excess dough so that the overhang is about ½” (10–15 mm). The trimmings can be used to patch holes in the dough (with indifferent success), but the best thing to do is probably to squish them together and stick the ball of scraps in the freezer; when you’ve accumulated enough such scraps, you can use them to make cinnamon-sugar rolls or some other application where a tougher piece of pastry would be acceptable. To form the crimp, simply place the forefinger of one hand against the outside edge of the ridge of dough, and squeeze the dough around that finger using the thumb and forefinger of your other hand. 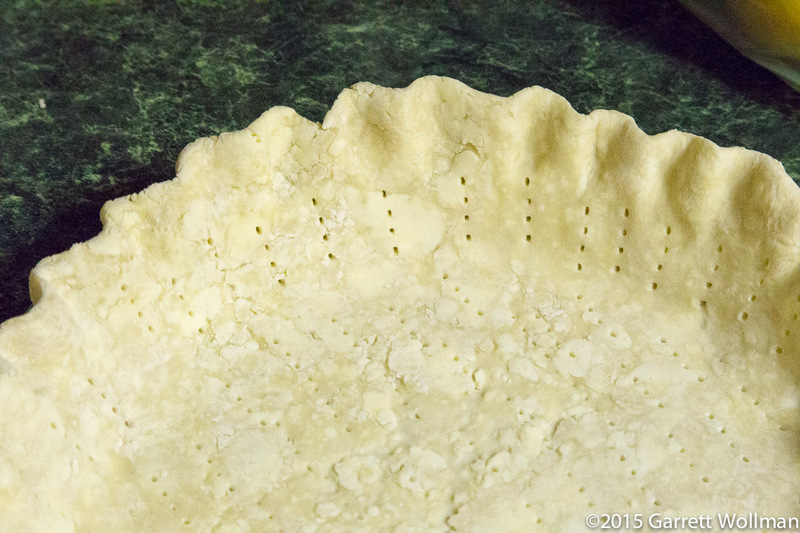 Rotate the pie as you go along until the whole edge is crimped. Press the dough forming the sides of the crust firmly against the pie plate, so that the crimped edge sits on top of the rim, to prevent it from slumping down as the crust shrinks during baking. The dough has now been worked so much that the butter is probably quite soft — unless you have a very cool kitchen — and it needs another rest in the refrigerator, at least half an hour. This pie shell is going to be “blind baked”, which is to say, it will be (partially) cooked in the oven before the filling is added. There is a lot of water in this dough — both the water that we added, and also as part of the butter — which will turn to steam during baking. By “docking”, or poking lots of little holes in the dough, we hope to prevent that steam from puffing up the dough and blowing apart the flaky layers of flour and butter that will give this crust its ultimate texture. You can buy a special tool for doing that, but I just use a fork. Make sure to dock the entire surface, both bottom and sides, about every half-inch (centimeter) or so. After docking, put the crust in the freezer for at least ten minutes. Meanwhile, arrange your oven racks in the bottom and middle positions, place a half-sheet pan (or jelly-roll pan) on the middle rack, and preheat your oven to 425°F (220°C). 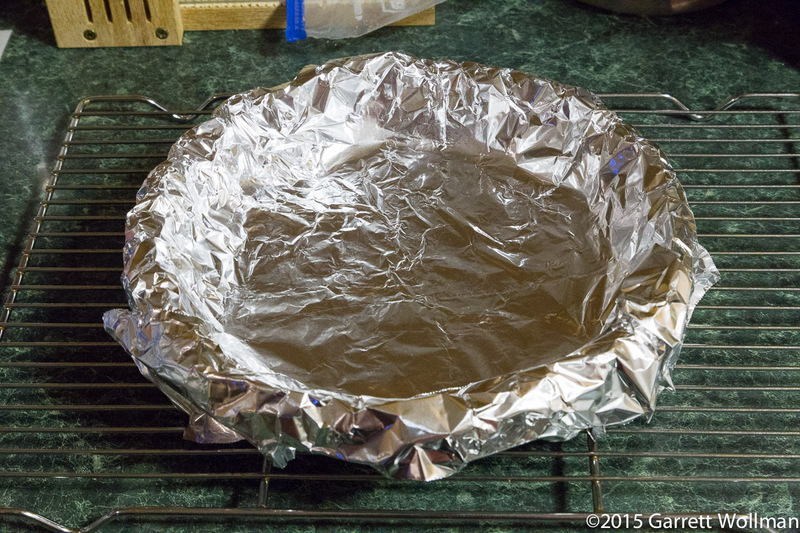 When blind baking, I prefer to cover the pie with aluminum foil. It’s easier to manage and press into place than parchment, and it reflects radiant heat so the crust doesn’t overbrown. As another insurance policy against sticking, I applied baking spray to one side of the foil. Take the crust out of the freezer and carefully press the foil into it, making sure that the foil makes contact with the pastry all the way around, and covering the crimped edge completely without flattening it. 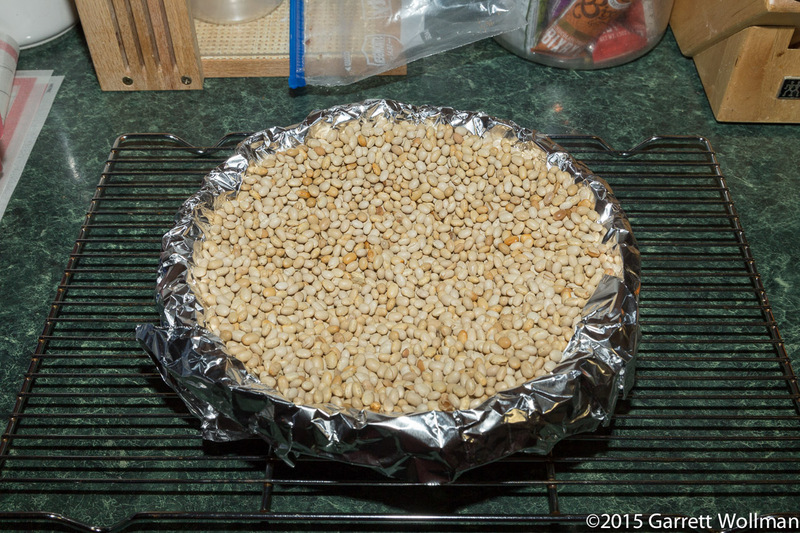 Fill the foil-covered crust with your favorite pie weights — you can use expensive ceramic-coated metal beads, or just do like I do and use beans (these are navy beans but any beans will do). 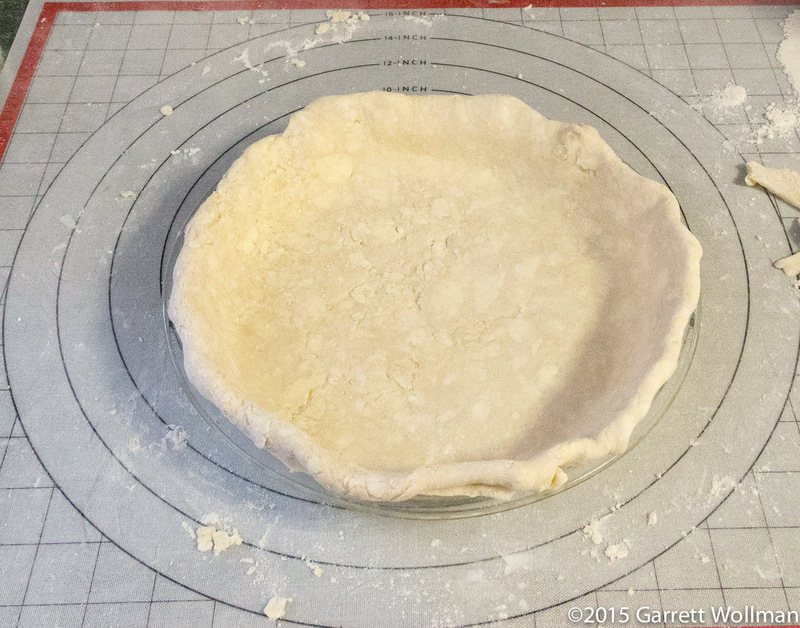 Place the pie shell on the preheated sheet pan and bake for 20 minutes. After 20 minutes have passed, remove the crust from the oven and carefully lift off the foil and weights. (Let the weights cool completely before storing.) Let the crust cool for a minute or so, then, using a pastry brush, paint the interior of the crust lightly with the egg-white glaze. This will help to waterproof the crust, which is particularly useful with fruit pies but doesn’t hurt for any kind of pie. Return the crust to the oven for three minutes (if partially blind baking) or until the crust is golden brown (about nine minutes) if a fully-cooked crust is desired. This is a very buttery crust, so some melted butter will very likely leak out of the pie plate and onto the sheet pan below. Allow the crust to cool completely before filling (unless the instructions direct otherwise — some fillings should be added directly to a hot crust). 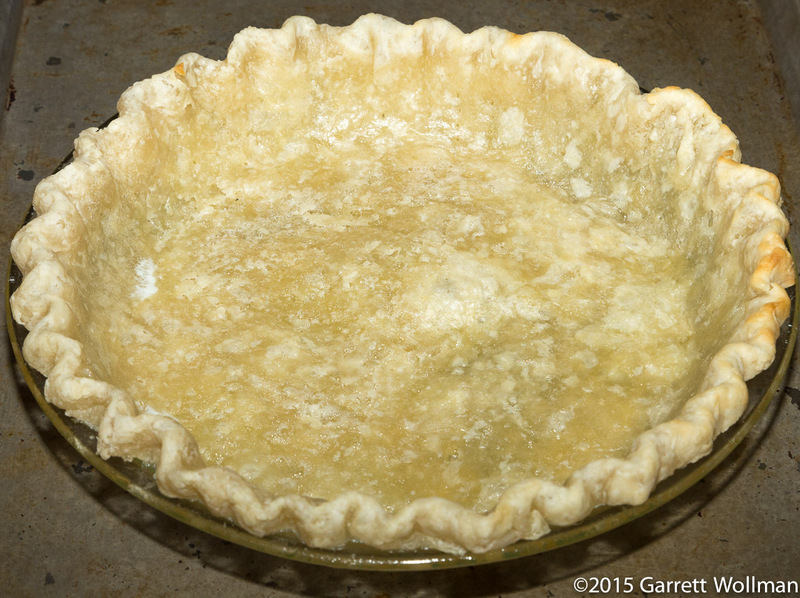 Gallery | This entry was posted in Food and tagged All-Butter Crust, Four & Twenty Blackbirds, pie crust, recipe, tutorial. Bookmark the permalink.